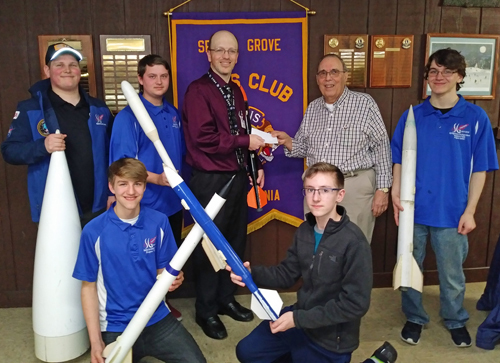 Lions Host the Spring Grove High School Rocketry Team: The club invited the Rocketry Team to join us for dinner at the club’s February 28 meeting. Team members brought along some of the rockets they have built and explained the various types of competitions they participate in. After the meeting Lion President Terry Lehr (second from right) presented team coach Brian Hastings with a $200 contribution. Lions Host the Spring Grove High School Mock Trial Team: The club invited the Mock Trial Group to join us for dinner at the club’s January 24 meeting. Team members shown here with team coach Jason Baker (far right), gave the club a demonstration of the Mock Trial competition. The club gave the team a $100 contribution. 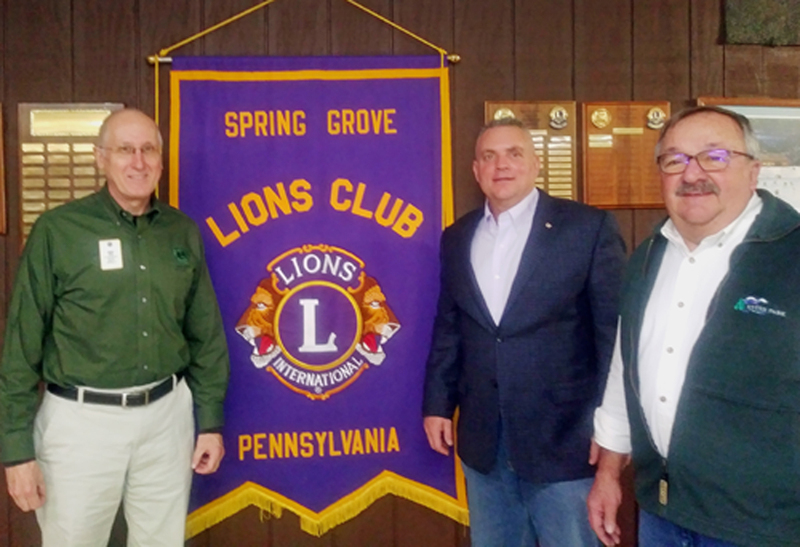 Lions Welcome New Member: New Lion Rory Pearson (center) was inducted into the club at the January 10th meeting. Lion Mike Flory (right) sponsor Rory for membership and Past District Governor Lion Dennis Cope (left) graciously agreed to perform the induction ceremony. Welcome Lion Rory. 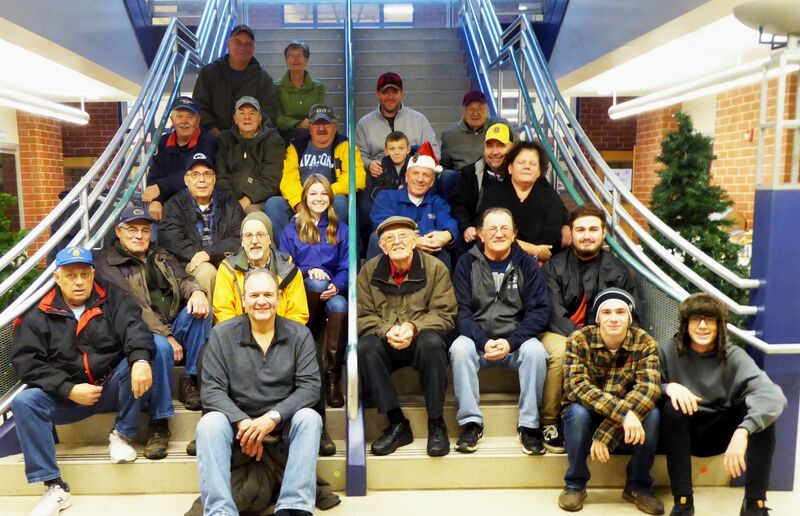 Lions Help Local Families at Christmas: Christmas Baskets Chairman Lion Dennis Myers (in Santa hat) fellow Lions and friends posed for a picture before delivering all the fixings for a family Christmas dinner to 27 needy families in the Spring Grove Community. In addition to the dinners, the club also distributed canned goods and toys donated by the Spring Grove Elementary School and gift cards from Kennie’s Market. Lions Celebrate Christmas: Spring Grove Lions gathered with there spouses at the December 13th meeting to celebrate Christmas, sing carols and share a Christmas dinner including this beautiful and delicious cake. Lions Award 32th Melvin Jones Fellowship: Melvin Jones Committee Chairman Lion Doug Wakeland (right) presented the Melvin Jones Fellowship Award to Lion Wayne Artz at the club’s July 26 meeting honoring Lion Wayne for his years of service to the club. The award includes a $1000 donation to the Lions Club International Foundation to support the Foundation’s humanitarian efforts throughout the world. Congratulations to Lion Wayne. Lions Help Fund District Projects: Lion President Terry Lerh (right) presents a check to Lion District Governor Linda Griffie at the clubs July 12 meeting. The money will be used to fund District 14C projects including: Pre-School Vision Screening, Beacon Lodge, Lions Club International Foundation, Leader Dog for the Blind, Sight Conservation and Eye Research, Hearing Research, Diabetes Awareness, and Lions Quest Life Skills Program. 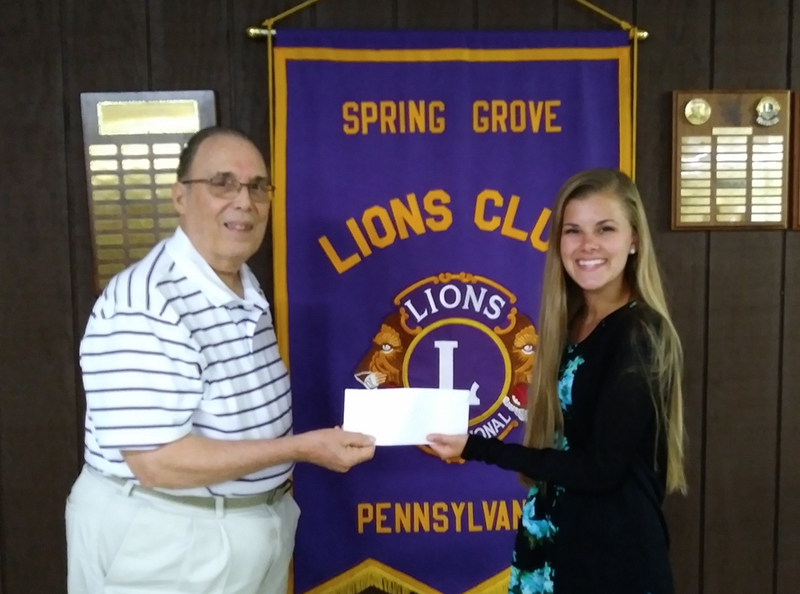 Lions Honor Scholarship Recipient: Scholarship Chairman Lion Terry Lehr congratulates Adelyn Uffelman, winner of the clubs 25th annual scholarship who was honored at the club’s June 14 meeting. The $1000 scholarship is awarded to the area high school senior who submits the best essay describing how they will use their studies to advance the goals of Lionism. Adelyn will be attending the Penn State University at Mt. Alto this fall and hopes to become a Physical Therapist Assistant. Congratulations Adelyn.